Professional framing can be very expensive, especially if you want to frame a piece of art on a stretched artist's canvas. 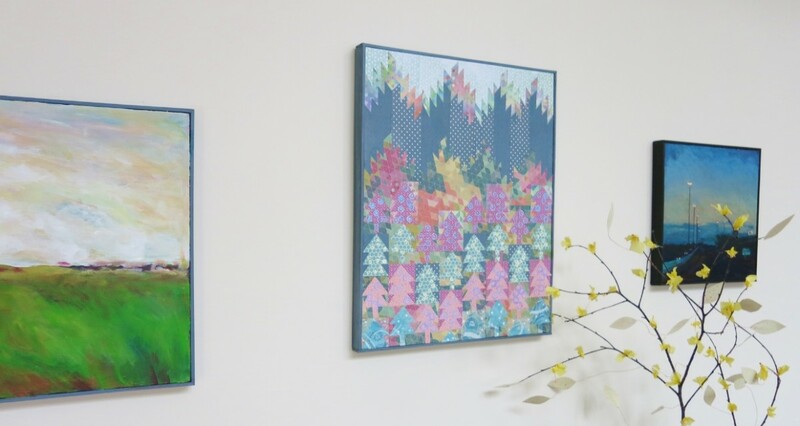 However, you can easily frame a piece of artwork on canvas using wood lattice and just a few tools. This is a technique that our professors taught students when I was in art school. And I still use this framing method now for my art at home. It may not be museum quality, but this framing creates a simple, clean finished look for any artwork on canvas. This framing tutorial does require a few simple tools and is written for someone who is familiar with properly handling and using those tools. 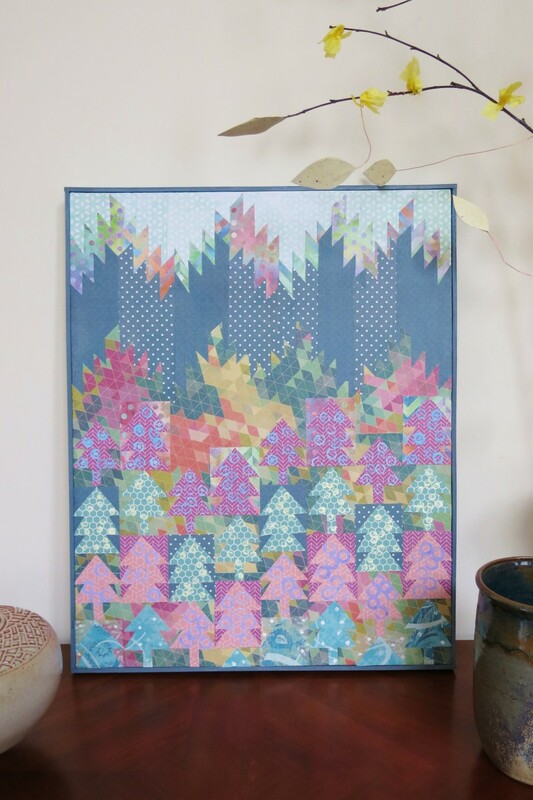 This tutorial uses wood lattice as the framing material. Lengths of lattice are available at most lumber yards and home improvement stores. It comes in a couple slightly different widths, and the length depends on the width you choose. I used the cheapest lattice I could find for this project. This lattice was 1 and 1/8 inch wide, came in an 8 foot length and cost $5.40 per piece. look for pieces with no cracks or splits. Even the smallest split is likely to get bigger when you start nailing into it. do not choose any lattice with any dark discolorations. 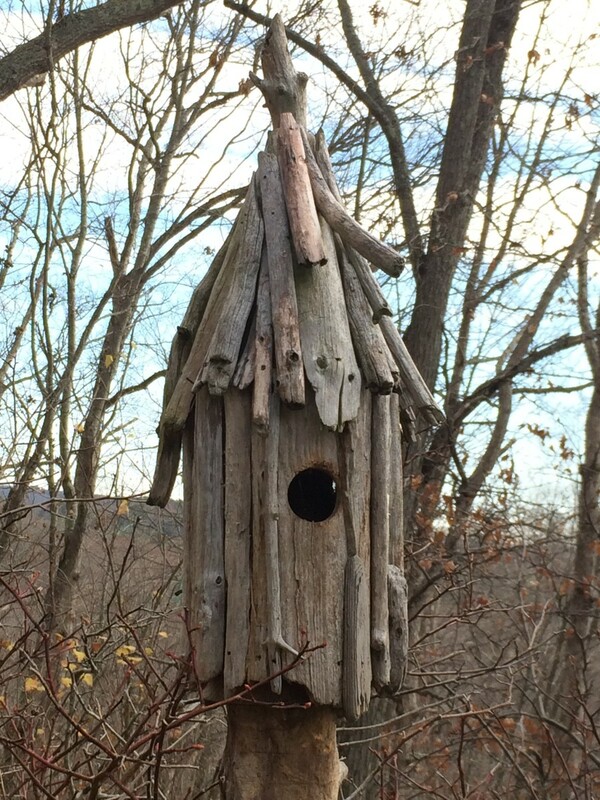 This could be a sign of wood rot. 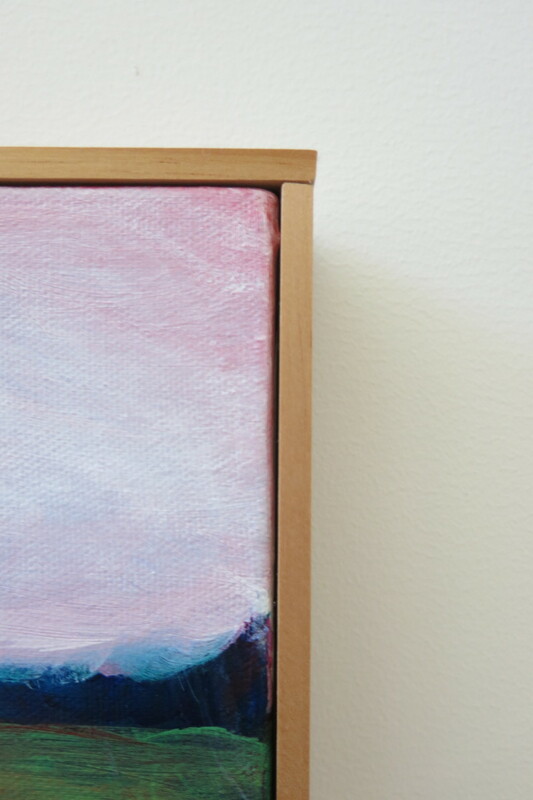 choose pieces with an even, subtle grain, even if you plan to painting your frame pieces. The grain will still be visible through the painting. Once you've selected your pieces of lattice, lay them on the floor at the store, first on its narrow edge, then on the flat side. Check for any bowing along the length, either from side to side, or curling away from the floor. 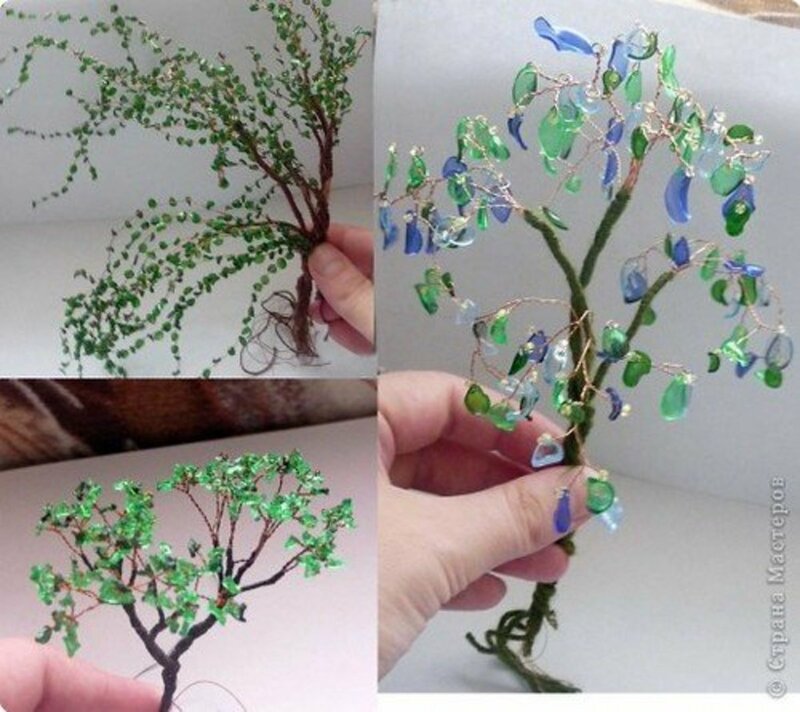 You want to buy pieces that are as flat and straight as possible. You may have to look at a number of pieces before finding the ones that are best for framing. 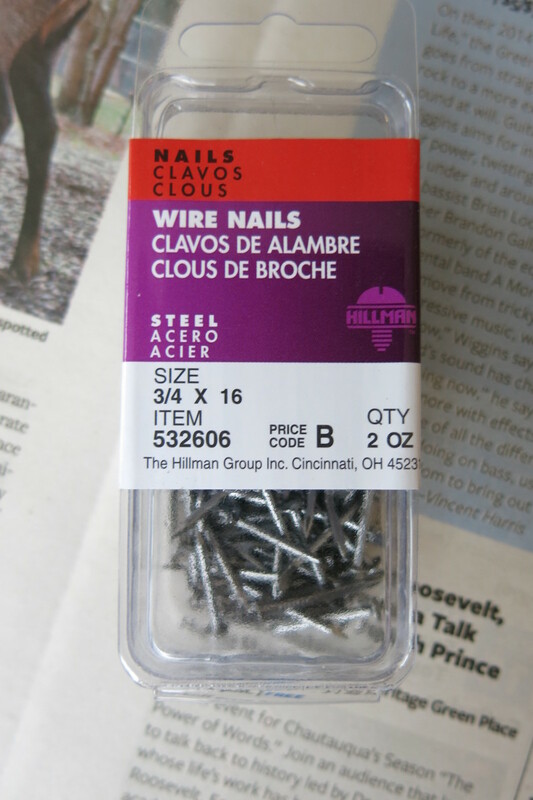 a box of wire nails or brads (long enough to nail through your lattice and into the stretchers on your canvas). 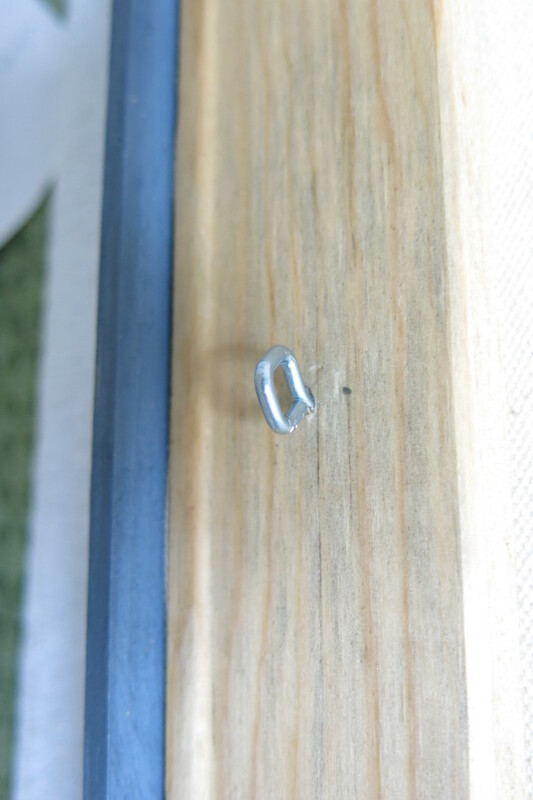 There are two ways to make a frame for your stretched canvas - with mitered corners or without. Mitered corners look more professional but can be difficult on a stretched canvas. My husband and I have stopped making frames with mitered corners for my artwork because of the frustration it caused. 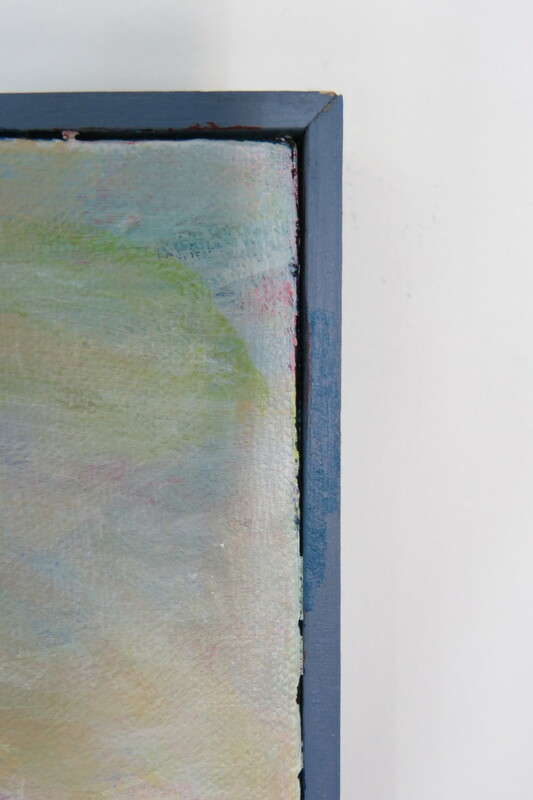 Stretched canvases are rarely square, which makes it challenging to match up the mitered corners. In addition, the staples and folds in the canvas create uneven sides, which caused gaps when you try to line up the corners. That said, mitered corners do create a more formal presentation for your artwork. 1. 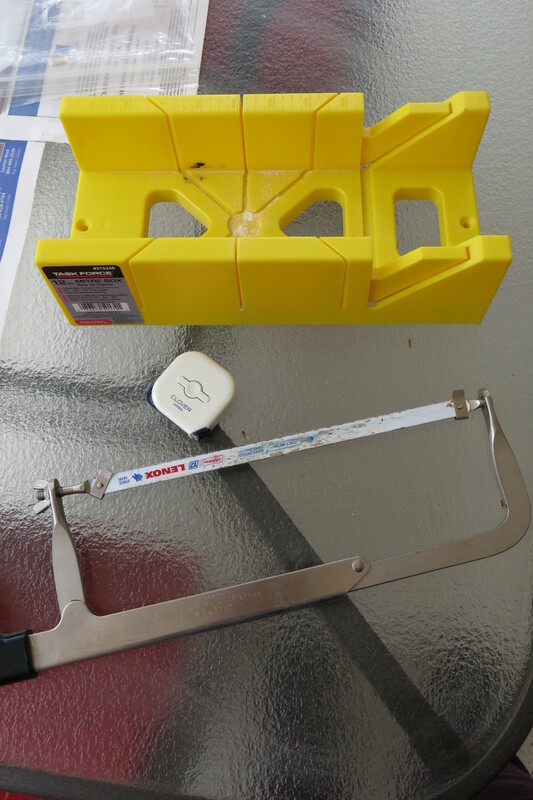 Using a measuring tape, measure each side of your stretched canvas. 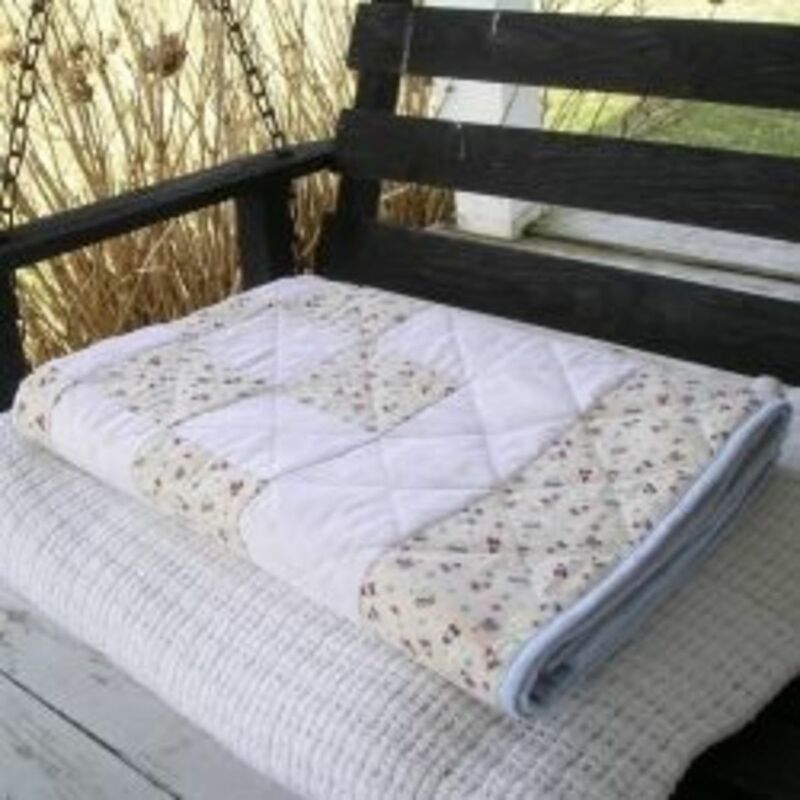 Add the length of these four sides together to get the amount of lattice you will need for your frame. Be sure to add a few inches to your measurement to account for the excess lost when cutting the bevels. You may want to figure in some extra length in case of mistakes. 2. 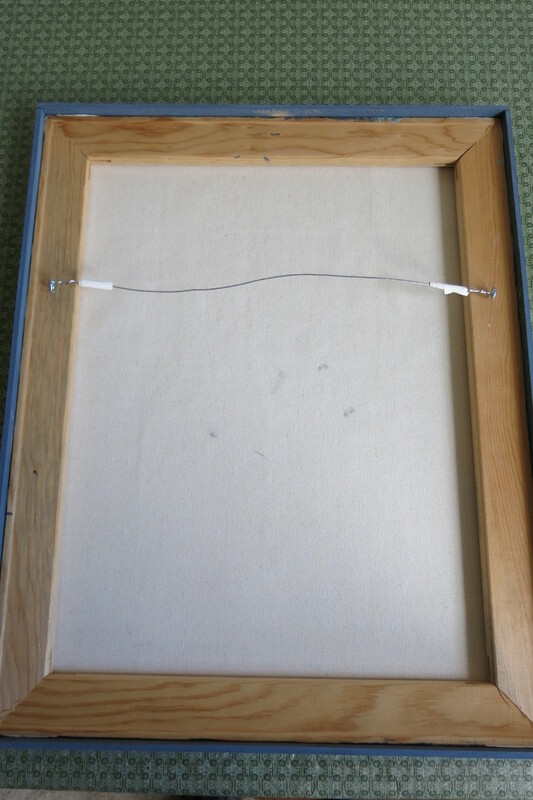 To start your frame, measure the length of one side of your stretched canvas. Look at your piece of wood lattice and decide which is the best flat side to be facing out as the outside of your frame. One side of your lattice will probably have saw marks, making it rougher, while the other side is smoother. You should use the smoother side as the visible side of your frame. 3. 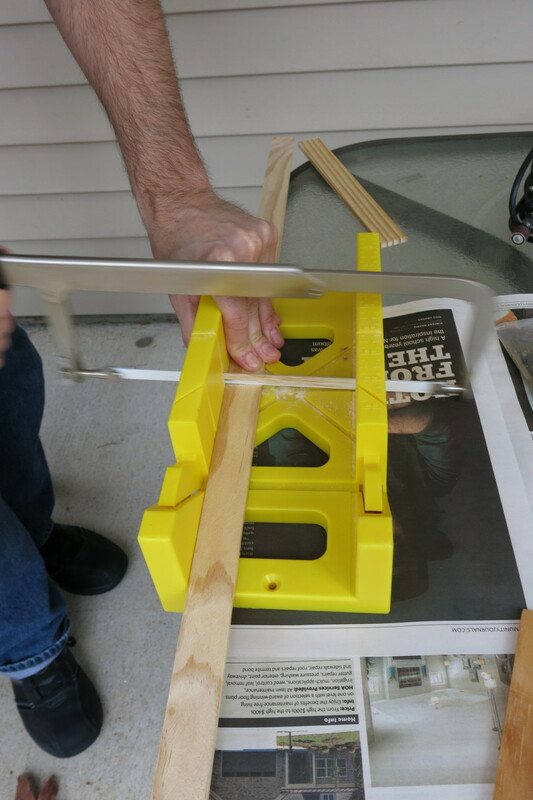 Taking your lattice, place it in your miter box with the narrow edge facing up. Cut your piece of lattice to the length you need, using the correct bevel opening for each end. The bevel cuts will create a longer, upper edge on each end, while the shorter side should be the length you need for your first cut for your frame (see photo above). Now check that this piece fits correctly against your stretched canvas. 4. 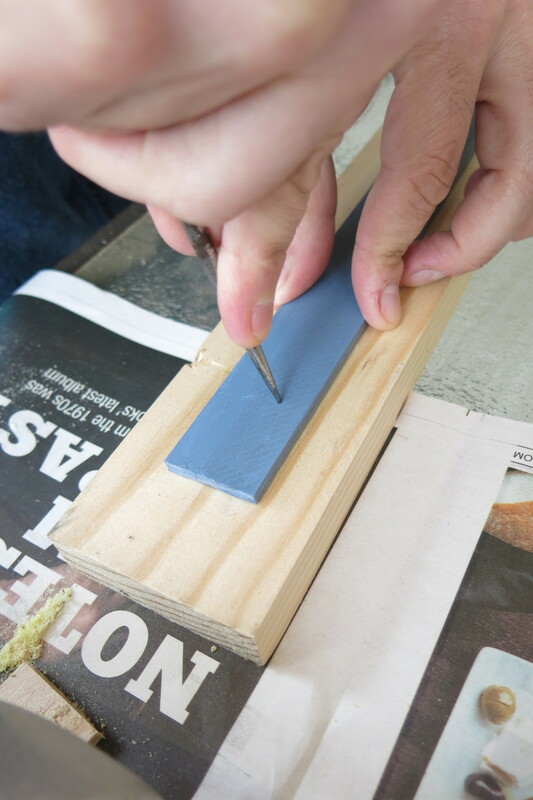 Lightly sand each end and label your piece of lattice with which side it should fit on - top, bottom, left, or right. 5. Continue to measure, cut, and label each side of your frame separately. Do not assume that the parallel sides will be exactly the same length. As mentioned above, stretched canvases are not always square and even. Take the time to measure and cut each side separately. 1. Mix up your paint color and cover your work surface. Use wood or lattice scraps to prop up your frame pieces. 2. Paint all four sides of your lattice pieces (be careful not to cover over your labels), letting each side dry separately. Be sure to paint the underside because it will show a bit on your frame. 3. Paint in even strokes, being careful not to leave any marks or fingerprints. Let your lattice pieces dry completely before assembling your frame. 4. 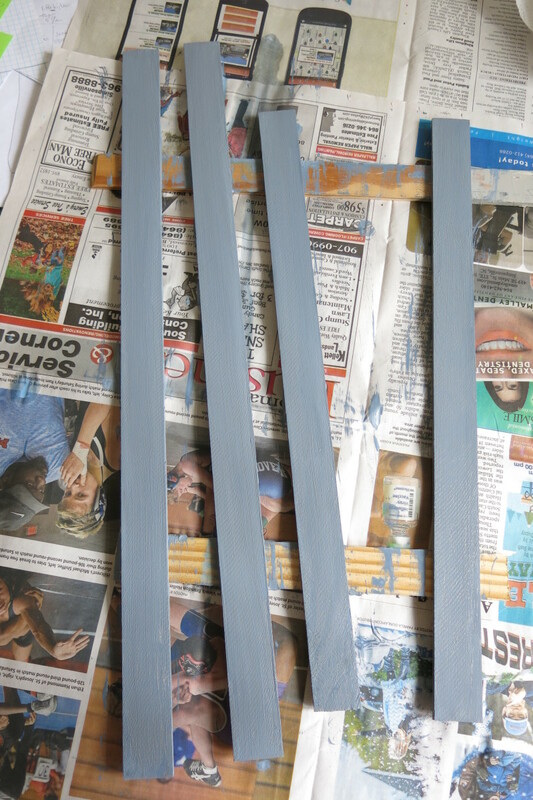 Reserve some of your paint to cover over your brads when your frame is complete. 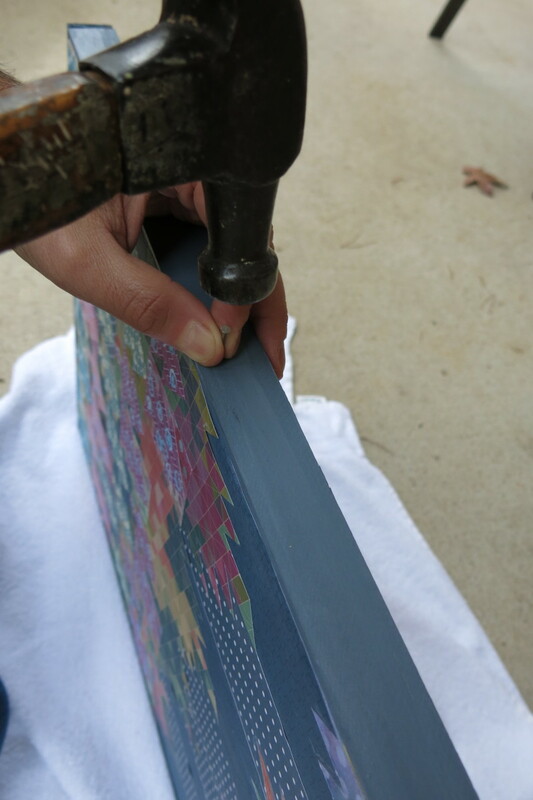 Before assembling your frame, put down a towel to protect the front surface of your canvas. 1. Take a piece of your cut lattice and place it in position against the correct side of your stretched canvas, being careful to check the label on the underside of your lattice. Make sure the shorter side of your piece is against the side of your canvas and the beveled side hangs out a little longer. You can either line up your lattice so that it is flush with the surface of your painting, or that it sits a little forward so it creates a small lip in front of your canvas. 2. With your piece of lattice held in place, use a pencil to mark the placement for your wire nails. Make a dot for your first nail in the center of the length of your lattice. This dot should also be in the center of the width of your lattice. 3. Next, make dots for the nails at each end of your piece of lattice. These dots should be about an 1 and 1/2 for each end of your lattice. Now fill in with additional dots for additional wire nails if needed. Place your nails so that they are about 4 to 6 inches apart, depending on the size of your canvas. 4. Working on a piece of scrap wood, use your awl to make starter holes at each of the spots for your nails. 5. Using a hammer and holding your lattice in the correct position, begin to nail the first piece of your frame in place, starting with your center nail. Drive this nail only about halfway in place. 6. Put your other nails in place, again only hammering them in about halfway. 7. Repeat steps 1 through 6 for the second side of your frame. Carefully fit your mitered end into the corner of your first piece. When you get a good, tight fit for your mitered join, you can nail all your brads on that corner in place. If you can't get a good fit at your mitered corner, you have two options: cut a new piece to fit, or work the two pieces you have to fit together so that at least the front (visible) corner looks good. You can also use some wood filler to fill in any gaps. 8. Continue steps 1 through 7 to fit and nail all four of your frame pieces together. 9. Use your reserve paint to touch up any areas and cover your nail heads if necessary. My husband and I make our frames with non-mitered corners (if that's a word). We cut the top and bottom pieces so they are long enough to cover the cut ends of the side pieces (see photo above). I actually like the way this looks. I think it has a more contemporary look to it. 1. Measure the right and left sides of your canvas separately. Again, don't assume that they are the same length. 2. Using a miter box, cut each of these pieces so they fit the exact length of each side. Use a straight cut with your piece of lattice lying flat against the bottom of your box (see photo above). Sand the ends and be sure to label the underside of each piece with the side it fits. 3. 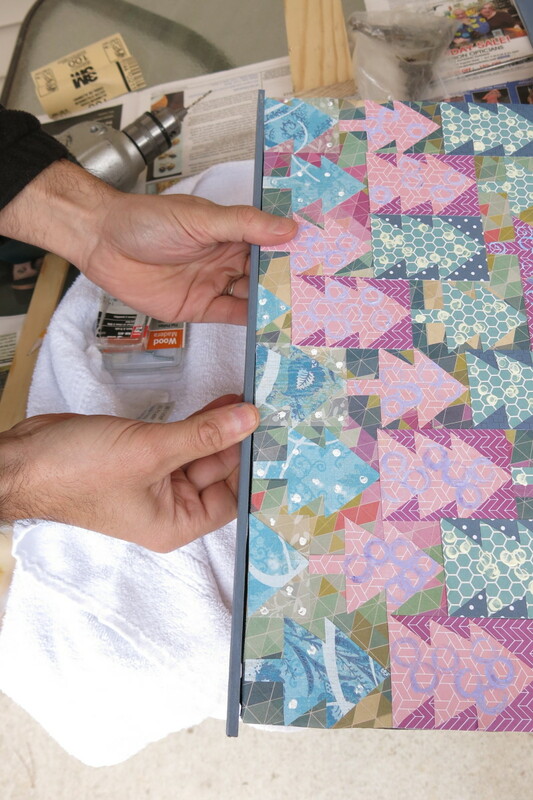 Now measure the top of your canvas, holding each of your two cut pieces on the appropriate sides. Include the depth of the side pieces in your overall measurement for the top (see photo at the top of this section). 4. Follow step 2 for cutting your top piece of lattice. 5. Follow steps 3 and 4 for measuring and cutting your bottom piece of lattice. 6. Follow the directions above for painting your frame pieces (if you want) and assembling your frame. Your non-mitered corners should fit together more easily. 1. Place your canvas face down on your work surface with the top away from you and the bottom of the canvas closest to you. You may want to put down a towel first to protect your artwork. 2. Measure the height of your canvas, include the frame if appropriate. 3. Starting on the left hand side, use your pencil to make a mark on the center of the stretcher that is one third of the way down the height of your canvas. Repeat this process on the right hand side. 4. Use your awl to create a starter hole in each of these marked spots. Now insert a screw eye in each of these holes. Screw the eye in completely, finishing with the eye in the vertical position (see photo). 5. Cut your wire so that it is long enough to span between your two screw eyes, plus add an additional 8 inches. 6. Put the wire through one of the eyes, with a tail of about 4 inches. 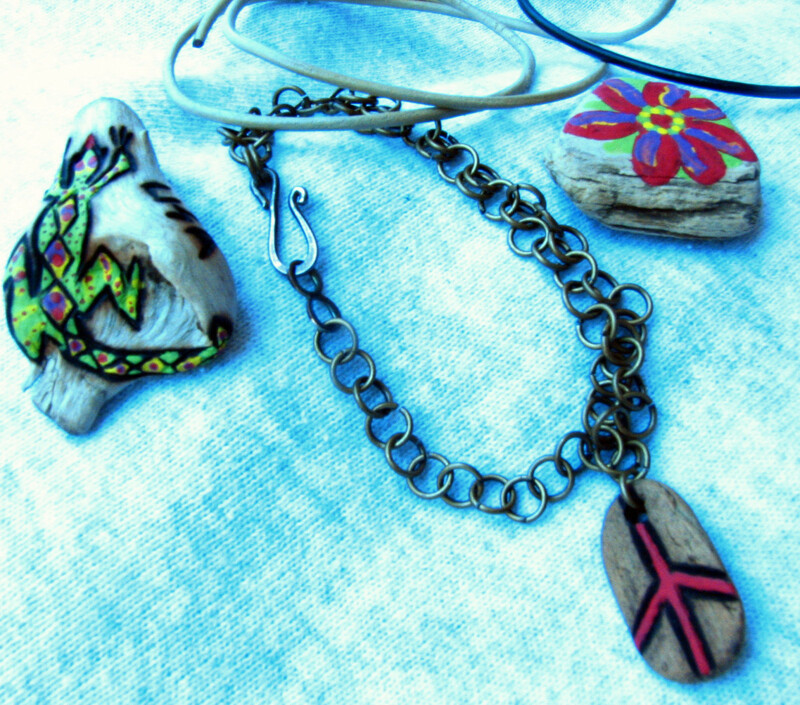 Bend back the tail and twist the end back onto the wire for three or four twists (see photo above). Leave any excess wire in place for now. 7. Put the other end of the wire through the other eye and pull it taut. Bend back this end and twist the tail back onto the wire for three or four twists. 8. Now trim any extra wire at the end of your twists with wire cutters. 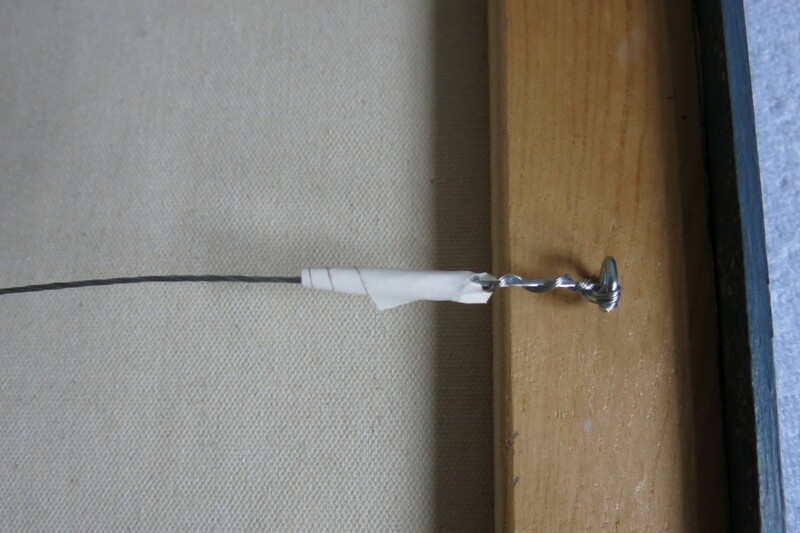 Wrap your wire ends with tape so that they won't scratch your wall. 9. Hang on your wall and enjoy! 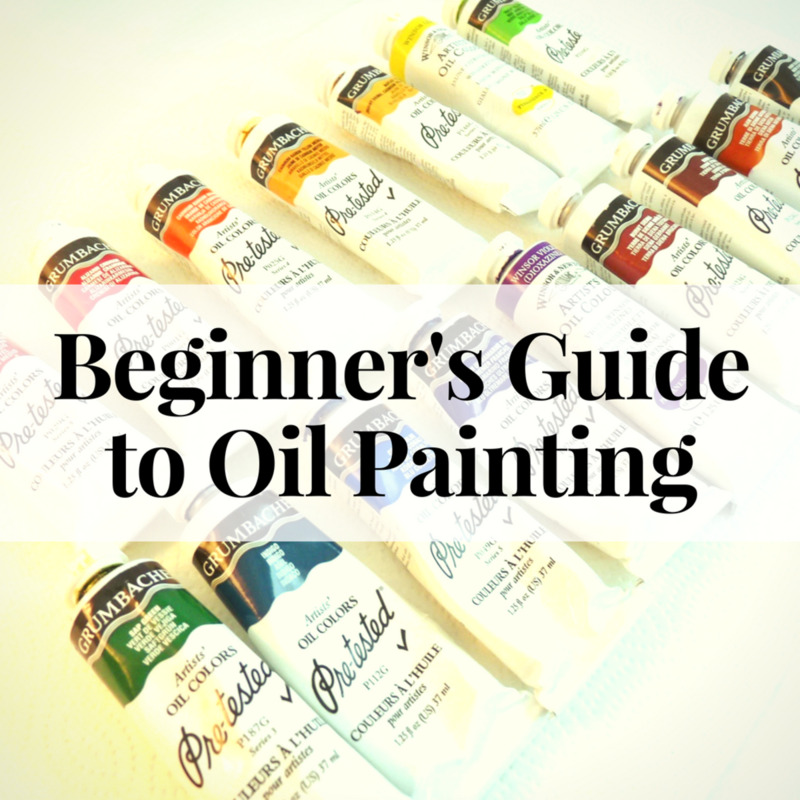 Why Should I Tone a Canvas, and What Colors Should I Use to Paint? 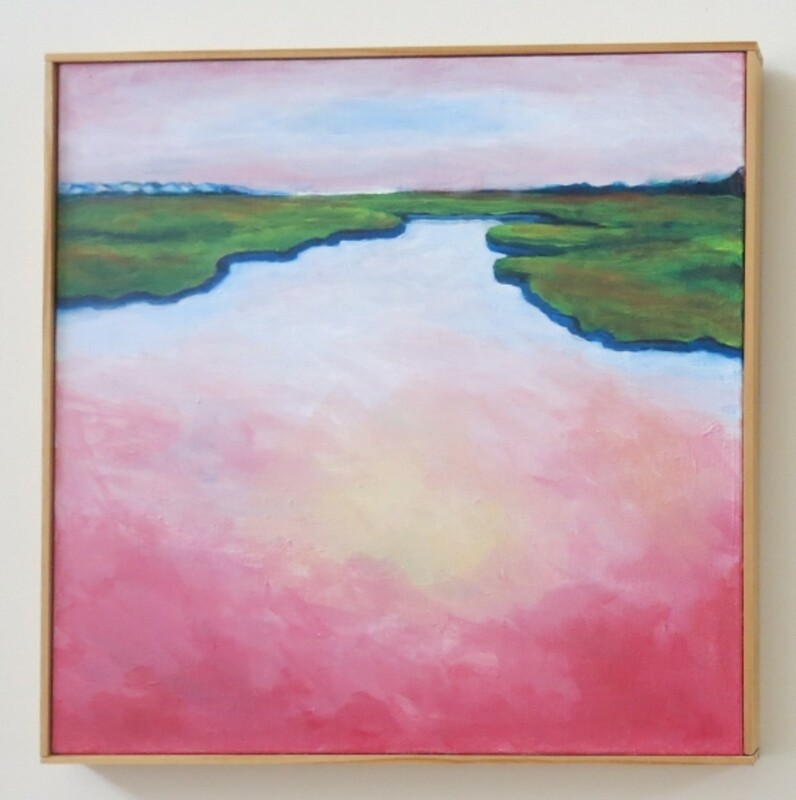 Hi Barbara - So sorry to hear about your sister, but it's wonderful that you have one of her paintings to remember her. I'm glad this tutorial will help you frame and enjoy her artwork. My sister passed away from cancer and I have one of her paintings that isn't stretched. I'll have to use your hub and try to do it myself. Thanks for some information that I will use. Thanks, Lorelei! Stretching a canvas is pretty easy once you get the hang of it. I'm sure you can find some tutorials online. Also, pre-stretch canvases are pretty inexpensive and can be found in a number of different sizes, shapes, and with different edges. Thanks for stopping by and commenting! Your painting is beautiful. My granddaughter is quite a unique artist so I was looking for ways to stretch and build her own canvas from the rolls. Hi Ann - Thank you for reading and commenting. Framing with glass is certainly more complicated - and I'm no expert - but there are a few options to do it yourself. Craft stores sell frame pieces as separate sets, where you buy the top and bottom lengths separately, then put it together yourself with glass, a mat, and backing. Or you could buy some L-shaped moulding at the home improvement store and build your own frame. You'll probably need miter vice to fit and nail the corners of your frame together, then fill in any gaps with putty and paint. Lastly, craft stores or frame stores should sell framing clips for a frameless design. These clips hold your backing piece, artwork, mat, and glass together for a clean display without a frame. 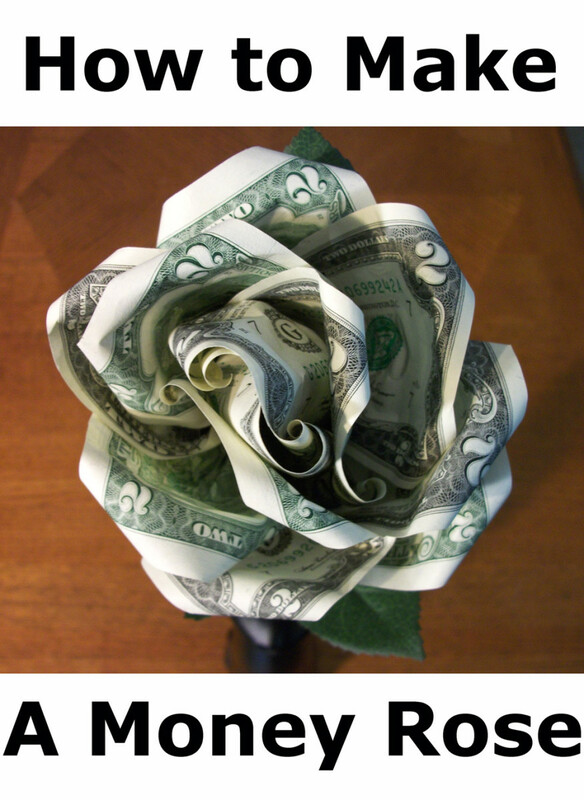 This would probably be the least expensive option. Hope these ideas help you out! Donna, Thank you for posting these instructions. This is exactly what I was looking for. 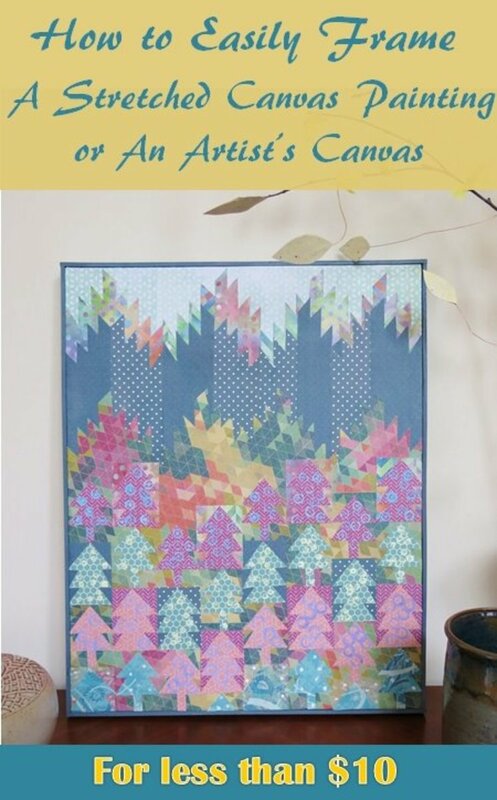 Hi teaches 12345 - I hope this tutorial offers an inexpensive and easy framing option for those who are looking to frame a stretched artist canvas. Thanks for stopping by and commenting. I appreciate it! You make it look so simple! 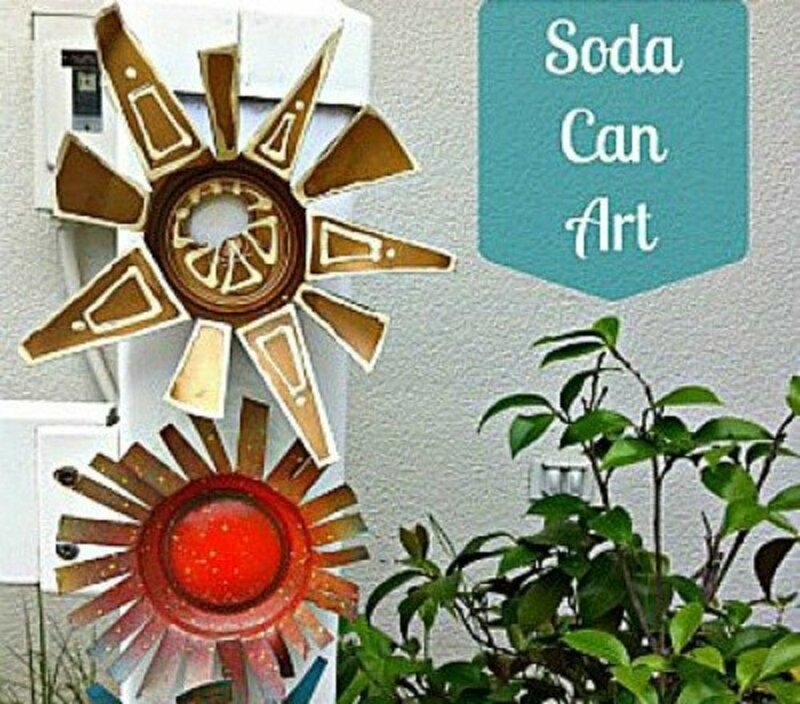 This is great for those people who are gifted and interested in artwork. Great, Dolores! So glad this tutorial will be of use to you. Hope you are happy with your framing job when you're done. Thanks so much for commenting! Hi Donna - I just stumbled on this and was so glad that I did. I have a canvas and was thinking about framing it myself. Thank you so much. I can do this! Sounds exciting, Heidi! I hope you are enjoying your classes. Glad this framing tutorial may come in handy for you. Thanks, as always, for reading and commenting! Last year I started taking some painting classes. Saving this for reference for future projects! Thanks for sharing the tips! Thanks so much, Sally! I appreciate your kind words and support. Hope you are having a great week! Well done Donna! Great idea and you carried out the instructions with impeccable style. You deliver every time.